Sharks have gained a somewhat negative reputation over the years – one that they certainly don’t deserve. Despite what Jaws might have you believing, these large fish aren’t roaming our shores waiting for human limbs to snack on. Unless provoked, sharks are relatively harmless, and as carnivores, their meal of choice is usually fish, squid, or seals. It’s difficult to say if this misrepresentation has affected the number of shark species that are endangered, but it does make it even more important to conserve them, and their dwindling numbers can have a real impact on the entire marine ecosystem. This is something we care about enormously here at Deep Sea World, which is why we have a dedicated angel shark-breeding programme as part of our overall conservation efforts. The breeding programme, which began in 2004, is a collaboration between us and Blue Reef Aquarium Hastings. It was the first of its kind to breed angel sharks that were successfully conceived in captivity. Once a common species found around most of the British Isles, angel sharks are now critically endangered. This programme has allowed us to ensure their conservation, and has demonstrated that it is possible to successfully breed them in captivity. 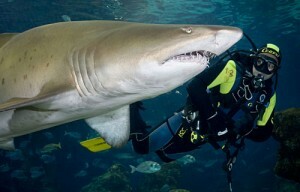 However, it is encouraging to see how many other species of shark can still be found in Scottish waters. Take a look at some of the wonderful species you can find right on our doorstep. Basking sharks are the second-largest fish in the world and can grow up to 10ft long! Every summer they make Scottish waters their home for the season, but they prefer open waters for the rest of the year, only moving close to shore in those warmer months. Unfortunately, they are easily harmed, because they prefer swimming near to the surface, causing many boats to bump into them. Although they are no longer commercially fished – thanks to legal protection since 1998 – being caught as bycatch in fishing nets is still a threat to them. This proximity to the surface also makes basking sharks relatively easy to spot because they move along at leisurely pace. More compact and bulky-looking than you might expect from a shark, porbeagles can be found several miles offshore because they prefer the deeper water there. Their foods of choice are mackerel and herring, although they have been known to feed on bottom-dwelling fish too. Thanks to their love of mackerel, they are often referred to as ‘mackerel shark’. Due to their relatively small size, porbeagle sharks are fished for sport in some parts of the world, which has led to the IUCN (International Union for the Conservation of Nature) classifying them as vulnerable. Although their status varies in different areas of the world, it is hoped that this classification will lead to them being protected by law in the near future. Although they’re not local residents, shortfin mako sharks do make seasonal appearances in our waters, and have been sighted all around the British Isles. Like porbeagle sharks, they are unlikely to attack humans unless provoked. Despite the shortness of their pectoral fins, shortfin mako sharks are one of the fastest shark species in the world. Unlike long-fin mako sharks, they can survive in much colder waters and have the ability to raise their body temperature higher than that of the water. Shortfin mako sharks are nomadic animals, which is why they can be found in so many parts of the world. 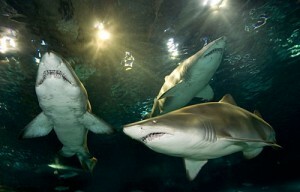 Like most sharks, they are apex predators and have no natural predators once they are fully grown. Tope sharks are most commonly found on the southern and western coasts of the British Isles, but they have a wide distribution all around the UK, so it’s not surprising to find them in Scottish waters. They can be identified by their small, slim bodies and elongated snouts. They are a migratory species, and individuals tagged in the UK have been found as far away as Iceland and the Canary Islands! 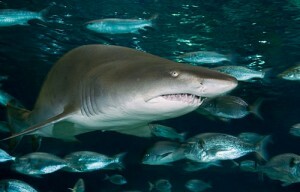 Like many species of shark, the tope is threatened by overfishing, due to the demand for its fins, flesh, and oil. In a bid to conserve the species, Greenpeace International added tope sharks to its seafood red list – a scientifically compiled list of species that it believes should not be commercially available. Unlike the blue and grey hues you would normally associate with sharks, dogfish sharks have tan bodies with light brown hues and dark-brown spots. They are a small species and usually only grow up to 3ft in length. There are several types of dogfish in UK waters, but the most popular by far is the lesser-spotted dogfish shark. They are so abundant that fishermen often see them as nuisances, because they sometimes get caught in fishing nets or take bait that is meant for much larger fish. Dogfish sharks can be difficult to spot, because they prefer sandy ground and tend to live and feed close to the seabed. However, they do enjoy the shallow waters and are rarely known to venture to deeper waters, so you’re more likely to spot them from the shore than you are on a boat trip. Although we have a wide range of sharks living in our waters here in Scotland, it can be difficult to get up close and personal with them in the wild. Marvel at these fascinating fish and explore some more exotic species at Deep Sea World. Book your tickets to wander through our underwater safari, home to the largest collection of sharks in Scotland, or,, if you’re feeling brave, enjoy a shark dive with our experienced team.